Helsinki City Museum’s flagship museum opened in May 2016 after a three-year intensive planning process as a unique, modern and accessible museum complex (roughly 3500 m2) of five old buildings from the 1750s to the 1920s, three courtyards and a modern extension at the core of historic city. What began as a normal building project was however turned into a deeper transformation of the museum. 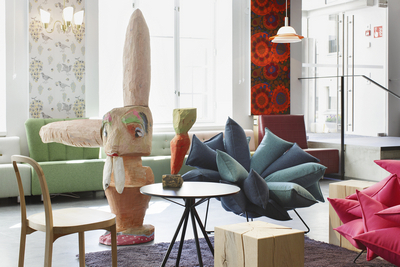 The museum focuses on Helsinki and memories of everyday life of its residents. We created an inviting and friendly, distinctive and emotive museum where the visitor can connect with the city and find something familiar and personal. Applying a multitude of design-thinking methods we developed a clear, coherent and participatory museum concept where services are based on motivation-based target groups focusing on an easy-to-approach overall experience with a twist of Helsinki. During the building project we had a chance to look into the very principles of how we were working. The goal was no less than to dig into the core of the museum’s existence. How to be meaningful to the people in our community? How to make a hundred-year-old cultural history institution, basically modern and in a good shape but with a low-key profile, into something that would be found and appreciated by not only the regulars, but also people who had never visited the museum before? The oldest quarters in Helsinki had already started to change from quiet office blocks into a lively neighbourhood with restaurants, shops and events, following a project by the City of Helsinki. Our objective was to build a museum that would draw people to these historic “Tori Quarters”. We also saw the new museum as a means to enhance well-being and good life of Helsinkians. The museum should act as an open setting where both the museum facilities and collections could be used freely in many ways. Our planning process started with crafting a new vision for the museum together with staff and stakeholders. The result was “Everyone has the opportunity to fall in love with Helsinki”, turning the point of view from the museum to the city and its residents. A clear and coherent museum concept was needed. The renewal was an opportunity for the museum to reflect on its role in the changing city. The museum could work as a platform for many different functions: as an enhancer of knowledge, as a Helsinki experience, as a social hub and as a platform and enabler. The Helsinki City Museum has had free entry since 2008, but now we had an opportunity to think through what it could mean for the visitor experience. One of the ways to widen the role of museums was to challenge the traditional space hierarchy. We wanted to create a new type of public, open space that would allow diverse encounters and that people could use for their own purposes. There are over 2400 m2 public spaces of free access. 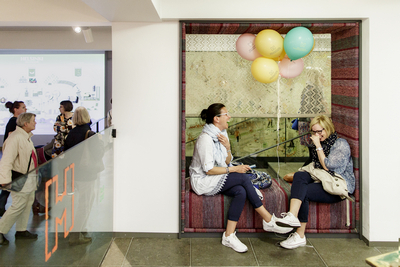 The playful and open lounges and immersive spaces such as the 1980s meeting room connected with a museum shop and café invite to meetings, relaxation, events or work. An investment was made in the interior design of the museum, bringing bits of Helsinki history to the public areas. The new museum brand and visual identity was created and celebrates the unconventional features of the museum: being welcoming, emotion-evoking, warm and easy to approach as well as being a museum about everyday life in Helsinki. The simple but strong logo reflects the museum’s vision, colours and typography are based on fragments of the past from the museum’s collections. To make the vision come true we started working together with city residents, and learning to understand our audiences. This lead experimenting with a vast array of participatory methods from personal interviews to customer panels, focus group workshops and from testing service prototypes such as virtual Time Machine to co-curating a photo exhibition. Our eyes turned towards the visitors, not only because functioning services cannot be designed without them, but also to find a true connection between the museum and the Helsinkians. The museum was to become a place made for them and with them. Using participatory methods and customer-centred design everywhere was a goal in itself. One of the keys to success was understanding that service design must be led by the needs of the visitors. The scale of participatory thinking and practices during the project was the broadest ever seen in Finland, and stands out even internationally. To create meaningful contents and experiences, we used audience segmentation as a tool. A set of motivation-based target groups was created and used thoroughly in the planning. The 1st floor Helsinki Bites permanent exhibition was created for all “Helsinki lovers” and encourages to share memories and experiences. The oldest house in the city, the Sederhom House, is dedicated to the youngest of the city: Children’s Town welcomes to hands-on learning and play for “the playing child with companions”. We also set out to reaching new audiences. The Fourth Floor first presenting the touring exhibition Museum of Broken Relationships, was attracting a new target group for the museum, the “urban, active, open-minded adult”. With object and story gathering this audience was connected with the museum even before it was opened and making the museum a full scale social media hit. The Fourth Floor is our experiment platform for emotive and challenging temporary contents. Exhibitions like the Smell, Helsexinki and Helsinki Clubbing have all been experimenting with different kinds of contents around unconventional urban phenomena and opening a platform for working together with Helsinkians, various organisations or communities. Especially designed for busy visitors and “accidental tourists” the Animated Timeline in the ground floor lobby presents the milestones of Helsinki history in three eras. The museum reached its visitor goal for one year, 200 000 visitors, in only four months. By the end of 2016, it had reached 315 000 visitors, doubling the museum’s previous all-time record. In 2017 the visitor numbers hit a new record of 362 000 making us to the top two Finnish museums, just after the National Gallery Ateneum. The visitor number is notable also compared to the number of people living in Helsinki, 600 000. We have reached thousands of people with different participatory measures, establishing a lasting connection with many of them. Also the plan to attain new audience groups succeeded. A shift could be seen in social media and in events organised by the museum. New audiences were visiting the museum and talking about it. Using the museum facilities in unconventional ways is a fact, too: People working with laptops are sitting in the museum lobby daily, and informal meetings and events are organised regularly. Getting through to people in the right way was proved in several surveys: for example 90% would recommend us to a friend, and the museum was seen as cosier, more fun and more laid-back compared to other Finnish museums. Already in 2016 we received several prizes and nominations, but the success was crowned in May 2017 when the museum won the Finnish Museum of the Year Award and a week later Museums and Heritage International Award in London.